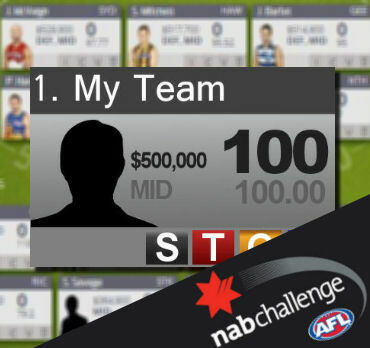 Another weekend of NAB Challenge is upon us, so let’s chuck up another My Team to chat about our teams! Head on over the www.dtlive.com.au and use the Drawing Board to put together your AFL Fantasy Classic, AFL Dream Team (RDT) or SuperCoach team using the no official prices and positions for this year. It’s free and easy to sign up and the site will continue to evolve over the pre-season. Post your teams (via the simple copy and paste on the Drawing Board) in the comments and discuss your fantasy pre-season. Be constructive and as always, give and get! The Deck of DT has been awesome so far and it will continue into mid-February! The games will officially launch over the next few weeks so make sure you’re prepared and chat it up in the comments. Is it risky having Pendlebury, Sidebottom and Swan? What are the Chances all 3 score over 100 consistently? I don’t think all 3 can score over 100 consistently, Pendles and Bottom yes, not so much Swan though, 80’s I think. Levi G will also be scoring big most games! Not risky if you think they will be top of their positions. You would still pick them if they played for other teams. Lycett or Nic Nat?? really depends on this weeks game i think. yeah depends on this weekend if Nic Nat can play at least 75% TOG and score 80+. WCE may manage ease him back early on like what they did last year due to lack of NAB games. if Lycett is sole ruck pick him.. otherwise go for someone like Hickey around that price .. or Belly or Giles. Chances on Anderson from Hawks to play round 1 ??? Anyone who wants a draft league. Starts at 9am tomorrow. 1 hour turn time to make it easier for people. Please select auto pick if you can’t make it. Would love to hear anyone’s thoughts! Ablett is under an injury cloud, be careful. Karnezis may be a little up and down. Put Clark on field. B Smith is currently owned by 1 in every 5 teams out there.. not so much a POD at the moment.. Jaensch is more POD than Smith. Adams over Walters but better options out for the value. Not sure who is Brent? Jaensch, goes unnoticed, but considered the best kick at Adelaide. Should avoid tags Smith may get. If Ablett is not named rd1 what are people going to do? Upgrade to Rocky or downgrade and use the money else or depends when he comes back just wait ? here’s my thoughts on Rocky – he is a beast when playing at home .. 3 out of first 4 games will be at home – captain lock there. except R2 against Kangaroos @Etihad when he only had sub 100s last season. then R5 against GC where he scored 157 & 190!! By then in R6 we should know how bald jesus is travelling and can decide to do a swap. only 2 games at home from R6 til the bye might bring his value down a bit. then bring him back after the byes when we’ve all built enough $$ to get Rocky back!! Why would you want to trade Rocky out? You would never trade Ablett, or Swan in 2012 or SJ in 2013, even if he was always suspended. I believe what Ninja_Turtles is proposing is known as a Broadbent, or Broady. Essentially, you trade out a premo to a Midpricer having a purple patch, get enough points and money from that Mid-Pricer to straight swap, or even downgrade back to the Premo. It is a viable strategy, but I would 100% NOT do it with Rocky. The risks are too high. If you are right, what have you gained, maybe 10-20 points per week. If you’re wrong, Rocky keeps scoring at an average of 135 and you don’t generate the money to get him. For more info on the Broadbent Strategy, check out this cracking article from Rids over at AFL Dreamers. rockliff and neale/griffin with 18k left over or parker and ablett(lewis if ablett isnt playing round 1) with 0k left over? Also need a replacement for honey church not trusting it..
340k left to play with also.